Product #2577 | SKU AT2050 | 0.0 (no ratings yet) Thanks for your rating! 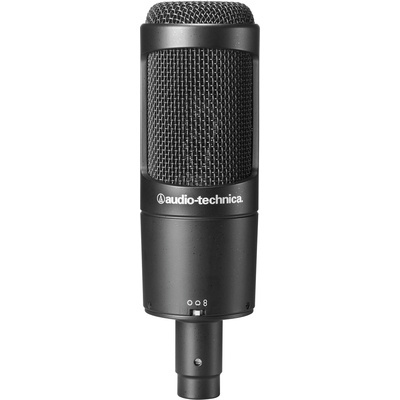 The AT2050 Multi-Pattern Condenser Microphone from Audio-Technica is designed for use in home studios, project recording, and live sound reinforcement applications. It can be used for capturing vocals, general instruments, and speaker cabinets. The side-address condenser microphone features user switchable cardioid, omnidirectional and figure-eight polar patterns for versatile operation. The element and output stage combine to produce a smooth yet natural audio quality with low noise. An 80 Hz high-pass filter switch minimises low frequency hum and other associated noise and a -10 dB pad switch provides more headroom when capturing transient signals that may otherwise cause peak distortion.